Gather friends and family around this lovely square cocktail table, offering a classic look in eight different oak finishes. We build this table with red and white oak, carefully chosen for its natural characteristics, and then we use a multi-dimensional finish to highlight the beauty of the grain. Dimensions: W42" D42" H17"
Our Bench*Made Oak collection offers purely American, heirloom-quality furniture. Bench made refers to furniture built with a high level of attention and detail, with each piece individually created from a craftsman's bench. It's a standard of quality that we uphold for our Bench*Made Oak collection. We harvest oak from Appalachian region in the eastern United States, careful to select pieces with high degrees of natural characteristics and beauty. 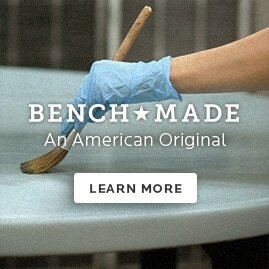 Our artisans then use those quality pieces of oak to create each piece-made to order-in Bassett, Virginia. Whether you need a coffee table, dining chair, panel bed, or more, our collection offers quality oak furniture that you'll enjoy for years to come.